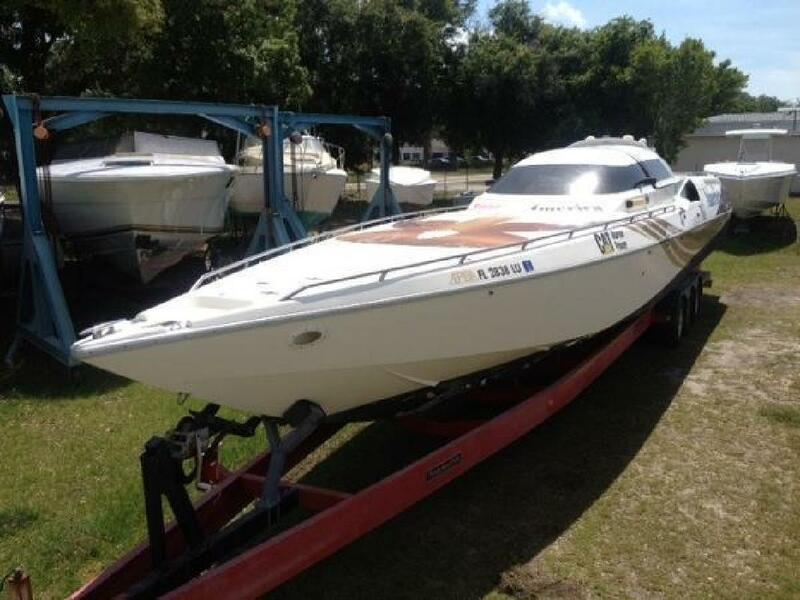 This 46' Cougar Custom Offshore Racer is available now. Hull only with 53’ trailer included. This boat's story is described below. In 1994 Great Lakes Power’s President Harry Allen made the decision to build a state of the art diesel powered endurance racer that would be the ultimate signature for the quality and reliability of the marine products Great Lakes sells and services worldwide. It started with a special composite 46’ English built Cougar hull which was modified to accommodate triple Caterpillar diesels and Twin Disc Arneson surface drives. Great Lakes Power’s management team assisted Richard Quandt, the project’s engineer and crew chief in designing and specifying the 18,500 pounds of engines, hardware and equipment that would be added to the 5000 pound hull. It incorporated several first time design features many of which are used in high performance boats 15 years later. John Cosker, Conner Marine and John Pompi, Marine Performance were also key participants in the vessel design, construction and upfit. The Spirit of America project was a culmination of Harry’s long time interest in offshore power boat racing which started with Cummin’s Engine Company in 1965 along with his dream of piloting the fastest boat from Miami to Nassau and back. The team’s first record was set on a 3 hour and 3 minute run from Toledo to Buffalo in 1996. Dave Bell, Great Lakes Executive Vice President was in the drivers seat with Harry at the throttles, Rich Quandt crew chief and navigator, and Eric Lavine as the onboard technician. Bob Hallengren of Caterpillar and Bobby Chan of Ringhaver provided valuable assistance in preparing standard production engines for their extended duty. They were also on board when the Sun Coast to Gold Coast record (originally established by Kyle Petty) was broken in 1998. That record would be a precursor to the Miami to Nassau to Miami record run which is documented in this video. On Monday morning, June 15, 1998 the crew of Harry Allen, throttle man, Steve Kildahl, driver, Kevin Brown, navigator and Rich Quandt, crew chief left the Marriot Miami Marina and headed out Government Cut (MacArthur Causeway) to set three new American Power Boat Association world records. Steve was a late driver change and replaced Dave Bell who had undergone open heart surgery the previous day. Fueled with 800 gallons of diesel fuel, the Spirit of America hit the starting line weighing in at nearly 30,000 lbs. The race was video recorded by Mike St Amand from a Hughes helicopter and monitored by APBA official Bill Opalich in a fixed winged Cessna aircraft. The vessels performance and record setting runs stand as a tribute to the dedication of the Great Lakes Power team of employees. It also serves as the standard bearer of the National Youth Safe Boating and Water Recreation Program for which it is named. This advanced design is still viable today and this boat can be raced in many classes of endurance and offshore racing.